Trademark is one of those important intellectual assets that can help businesses establish their own identity and recognition in the market. Thus, it is important for business owners and entrepreneurs to make a clear-cut plan about how to brand their products and how should they go about filing their trademarks. Like patents, trademarks should also be given equal weight because much of the success of your business will depend on the worthiness of your mark in the market. Let’s discuss the major points to consider before filing a trademark application, in the following blog. 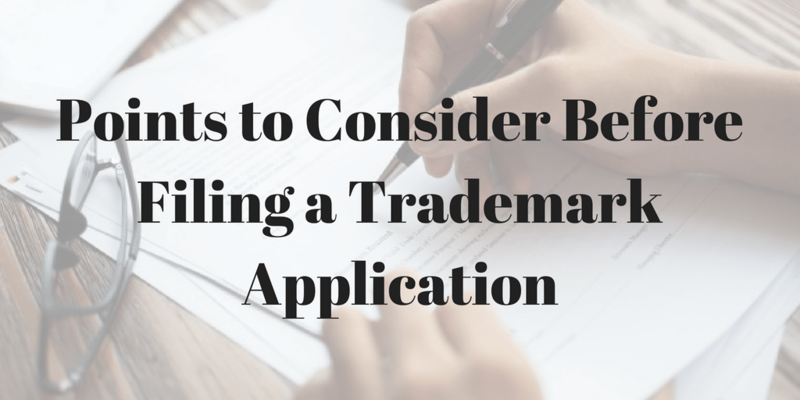 What To Do Before Filing A Trademark Application? However, picking and registering any name wouldn’t be of much value as you may face infringement in case you breach someone else’ protected brands and you will have to pay a price for it. Likewise, if you don’t pick marks worthy to be granted trademarks then your whole attempt will be futile. Thus, it is becoming important for brand owners to make a full-fledged strategy to protect their brands with appropriate trademarks. Since trademark filing involves plenty of techno-legal procedures it is important to get acquainted with the norms of filing trademarks in the respective jurisdiction. In case you don’t have much exposure in this domain you can hire some trademark specialists who can create such a strategy for you. Whichever may be the case, whether you file it on your own or take help of a professional trademark filing company, you need to know some basic facts that can help you pick a better name and do things prudently. We will present some brief on the important facts pertaining to trademark and trademark filing which every person as an entrepreneur should know. 1# Take use of the mark actively: The chances of granting a trademark increase manifold when you have a documented proof that you have been using that goods/service for a considerable period of time. In the United States if you are filing a mark for the trademark but you have not been using it in any of your products or services chances are that you may get the rejection. The important takeaway is that if you are intending to file a trademark application, do use that mark in your products or services. 2# Do full trademarks search before picking marks- Most of the times entrepreneurs show reluctance in doing a full trademark search prior to filing a trademark application which is detrimental to overall business goal and you may have to pay a heavy price for it. A full trademark search lets you taste the worthiness of your mark and help understand if it is safe and worthy to be picked as a mark for a trademark. There are plenty of databases available these days that trademark search professionals can use. For example, if you wish to gather trademark related data for U.S. jurisdiction then Trademark Electronic Search System (TESS) could be the best search database. However, if you wish to get trademark data for the whole world then WIPO Madrid Database could be the best option to go with. 3# Go for a registered domain name- In case you wish to go digital with your brand make a full-fledged online business policy and the whole thing starts with a suitable domain name that is registered. Doing businesses with an unregistered domain name could be detrimental to your future goals. We, at The Trademark Search Company, lets you focus on building the right brand by providing comprehensive TM search and monitoring services. Visit our service page for more details. This entry was posted in Blog and tagged doing a full trademark search, filing a trademark application, Legal Procedures, Monitoring Services, Professional Trademark Filing Company, TEES, TM Search, trademark data, Trademark Electronic Search System, Trademark Filing, Trademark Search Company, Trademark search professionals, Trademark Specialists, WIPO Madrid Database. Bookmark the permalink. ← Trademark For Your Business: Do You Want One?